I am still on track with my Tales from the Isle of Purbeck MKAL, having just finished knitting clue 3. I think this will be the largest, warmest shawl I’ve ever knit! 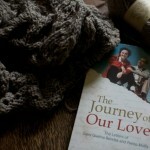 I have been so focused on my knitting that I haven’t had the time or inclination to do much reading this week. 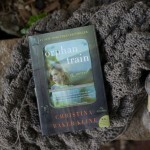 I picked up a copy of Orphan Train , and plan to get started on it soon. I’m having a hard time staying focused on any of the books I’ve started lately and this one sounds like it will be pretty engrossing. sounds like a really fun knit! looks lovely! 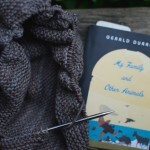 I really enjoy seeing what you and others are knitting and readinG! 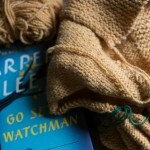 Im knitting mittens and Im reading…blogs! 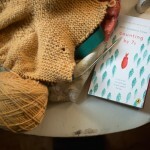 Your shawl looks like something I want to throw around my shoulders, grab a tea and a good book! 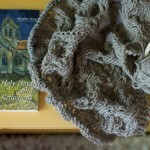 The shawl looks delightful, the soft grey is perfect to go with any colour. Thank you for hosting the yarn along. Did you finish the Orphan Train book? Here in Minnesota we are the recipient of many of the Orphans who traveled out of New York by train. Many became “helpers” on farms in our area. Some really sad stories told by the orphans. A few are still living here. Maybe when you are done reading it Ginny I could borrow it? Thanks for continuing to host the yarn along. It’s been a long time since I’ve linked up, and I always appreciate the opportunity to share, learn and be inspired by this great community! Your shawl looks so soft- yummy! Hope you will enjoy reading the new book and it is easy to stay focus on! 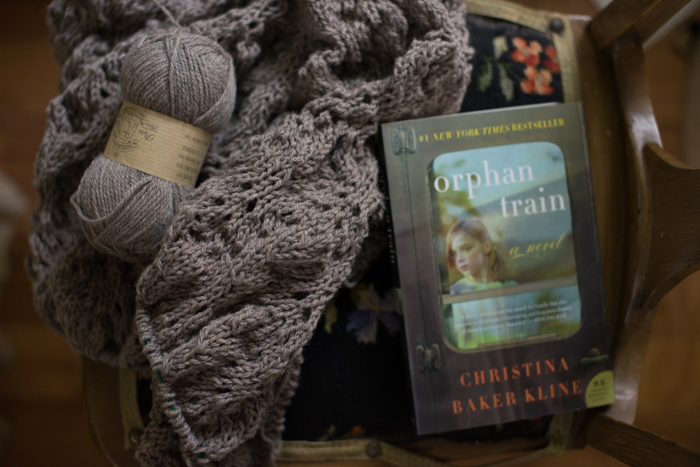 I think Orphan Train will be able to capture your attention. I really enjoyed it and I’ve been struggling lately with books holding my attention. I do not knit but I really would like to be able to knit a pair of prayer socks for a dear friend! Do you think it’s possible to do without ever having knit a single stich? Love your knitting. All your stitches always look so perfect! Well I’m 2 rows into Clue 3 since after work I had to make a rhubarb dessert for my husband’s work with all the other chores. It was one of those recipes where you make a crust in an 8×13 pan and bake it, then put the rhubard filling together and bake it, then make the meringue for the top and bake it (kind of like a pie in a cake pan). I think we receive Clue 4 today if I remember correctly. I’m excited to see it! I really need to try the yarn you are using for your KAL. It is gorgeous! I listened to The Orphan Train on Audible and it was pretty good. Your knitting looks beautiful Ginny and the yarn you picked is so pretty.